I have been a long time proponent of wood construction, especially in the Ottawa-Gatineau region. 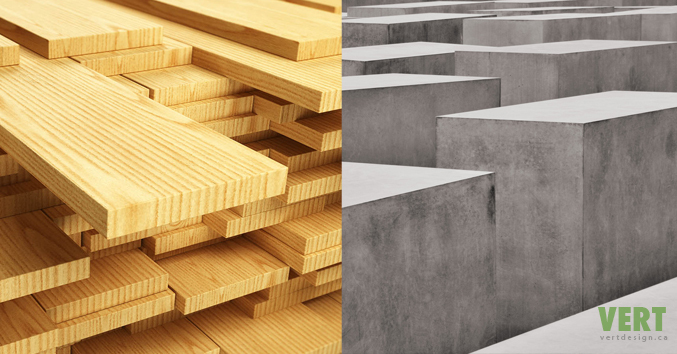 Our history is so deeply rooted in the forestry industry that building with any other material could be considered a form of industrial-cultural sacrilege. My new passive house project at 15 Dufferin Road – 205 Crichton Street will be built in two phases. The first phase involves the construction of a new 2,000 square foot home on an infill lot within a heritage conservation district. In the second phase a 1,200 square foot second floor addition will be added to an existing single story home built in 1945. The project will be certified to the Passive House and LEED Platinum standards. The most notable thing about the otherwise unremarkable piece of architecture found on the site is the fact that it was built with masonry when most other homes were (and still are) built with wood. (The home’s walls are built using 10″ blocks below grade and 7.75″ block with 4″ brick above grade.) This fact motivated me to consider alternatives to the new pre-manufactured wood wall assembly I had intended to use. what materials are used to make the assembly impermeable. Although one might attribute different weighting to the factors I list here, more often than not, wood is my preferred building material (above grade in residential construction). Notwithstanding my opinion of concrete versus wood, I chose to build my current passive house project using steel reinforced concrete insulated within expanded polyurethane forms (EPS). Why? Well, I do believe in the adage: Don’t knock it until you’ve tried it. Until now, I have never been involved in a project that uses concrete (poured on site, in blocks or in panels) from the footings to the roof. 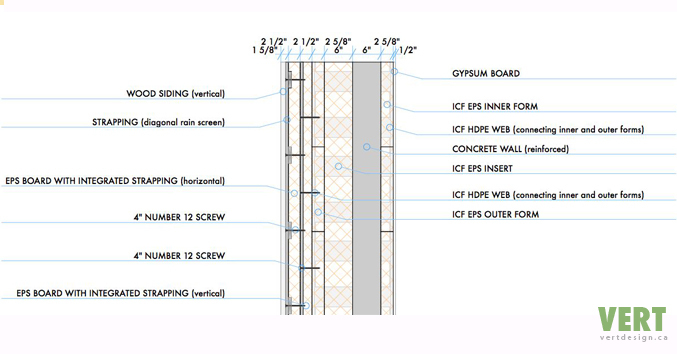 (I have done quite a few basements using a variety of insulated concrete forms, also known as ICF.) Projects that I plan, design and build for myself provide me with the opportunity to try things that I have not done before. As a result, I am in a position to make recommendations to clients based on personal experience. The most significant difficulty in designing and in constructing better built buildings in a northern climate are the challenges associated with air sealing the building envelope, especially where different materials intersect. The actual construction is made increasingly difficult as temperatures fall below freezing, since products used to seal joints become more difficult to apply effectively. These two points influenced my choice of building materials because my project was to be a winter-build. the wall is monolithic and impermeable – it does not require tape, caulking, adhesive or additional membranes to become airtight.